Ideally located at the foot of the Saint-Charles central train station (TGV high-speed and regular trains), and just minutes from downtown, the Residhome Saint-Charles serviced residence offers high quality apartments and hotel services. The residence is situated right in the heart of Euroméditerranée (the new business district), just next to the Saint-Charles train station. Just a few feet from several metro stations, use them to explore Marseille, its history through the ages, heritage, and culinary and artisanal traditions. You can simply stroll down the Canebière to arrive at the Old Port and enjoy one of the best views of the city. Notre Dame de la Garde, the palais du Pharo conference center, and Saint-Jean Fort frame this stunning panorama. Whether you are traveling for business or pleasure, take one of the boats moored in the harbor to discover the city from the sea, its islands, and its famous 'calanques'. Other must-see sights: the Vieille Charité (museums, cultural center), the Abbey of St. Victor, the neighborhood of l'Estaque, Château d'If fortress, the Frioul Archipelago, or Stade Vélodrome for soccer fans. 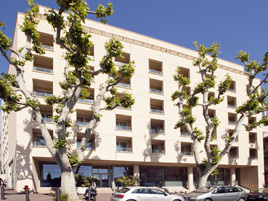 Open 24 hours, the serviced residence is made up of 103 air-conditioned apartments, ranging from studios to one-bedroom units, with a view of the Notre Dame de la Garde or the Porte d'Aix triumphal arch. Our apartments, tastefully decorated in a modern style, include a kitchen area (glass-ceramic cooktop, dishwasher, microwave, refrigerator), a bathroom, and a flat-screen television. Several supplementary services will make your stay a smooth one: buffet breakfast served every morning, laundry facilities, parking, a Food Corner, etc.